ATTENTION, All RETAILERS! Become Need Fillers by Offering Electronic Bill Payment Service Solutions. Top Up Prepaid Wireless Cellular - Bill Payment Center Walk-in Money Solutions and More! Programs and products that make your store a wireless destination, Without question, mobile phones and devices are essential tools for everyday life. Your walk in customer need these wireless payment system to conduct personal and professional business, plus your walk-in customers need your place of business for an convenient way to access, the cellular bill payment system, that's designed to bring repeat foot traffic to your store fronts. Our wireless products are the solutions to which they are turning to. Your store will become an Authorized AT&T Premier Cellular Phones Activations-SIMS Power Store Merchant Retailer Payments System, indeed designed to bring returning foot traffic too merchant retailers. You don't need to use multiple systems now to process different type of bill payments, our online system gives you access to over 95% of the pre-paid wireless bill payment transactions all under one system. Get access to all these feature and more via our convenient easy to-use online retailer portal with activations, reloads, number transfer/porting, and reporting with AT&T national brand recognition, that's designed to bring repeat foot traffic to your storefront. Draw More Customers into Your Store & OFFERS store owners the BEST DISCOUNTS IN THE INDUSTRY. You will be able to make payments to Boost Mobile, Cricket Wireless, MetroPCS, AT&T, Verizon, Page Plus, TracPhone, Simple Mobile, Net 10, H2O Wireless, LycaMobile, T-Mobile, plus many more, major or small cellular carriers in your area and international top-ups, for your walk-in customers. Plus, you get the BEST DISCOUNTS IN THE INDUSTRY, Other companies care about their bottom line. We CARE about YOURS. It's not how SMART your business are, It's HOW your businesses are SMART!. Prepaid Direct Wireless is your partner for wireless refills and for the latest in the prepaid no contract marketplace. At Prepaid Direct Wireless, we value efficient and reliable use of technology to simplify and expedite the prepaid mobile refill process. Our robust, easy-to-use, web-based technology platform, coupled with our industry-leading customer support, sets us apart from our competition. We are fast-growing and high-efficiency, with a rapidly evolving network of retailers and distributors that allows us to keep our offerings comprehensive and our rates competitive. Simple Mobile, Net10, Ultra Mobile, Lyca Mobile and much more!. These prepaid cellular phones carriers have Nation-Wide foot print, AT&T offers best DISCOUNT rates margins to your business and most reliable services to your customers. Place point of sale signs inside your store, outside or gas pumps, we send out to you free of charge, that inform, walk-in customers you offer quick easy fast recharge bill payments directly from your store for repeat store foot traffic, therefore increased store revenue. Increase your margins and empower your business with the latest marketing and distribution platform. are the best in the industry hands down. increase your walk-ins by up to 300% within 90 days. for all your sales agents and track sales through individualized reporting. average 75% more refills to their doors than other retailers in their area. More than 50 million cell phone customers utilize prepaid services and with the majority of them preferring to pay for their services in person, a reliable retailer they can depend on for fast and easy transactions is a must. Prepaid Direct Wireless partnership with Boost Mobile, Simple Mobile, Virgin Mobile, Page Plus, plus many more!, Almost the entire list of cellular wireless providers allows your business wireless cellular store or retail stores to be the retailer your business need, in addition importantly the retailer your customers will be loyal to. Call Now Today or sign up: Call Today 1.877.947.3577 for more information to receive amazing rates for your business for prepaid cellular phone airtime refills. A SMART Solution Made For Smart Merchant Retail Businesses! The Wave Of The Future. The SMART Solutions. Money Solutions Help Businesses Achieve Their Desired Business Results!!! Your customers are buying prepaid products somewhere. Why shouldn't they buy them from you? Walk-in bill payment services for retailers blog: Click Here! Our Fill-in-One Solution will keep them coming back to your store every week while our excellent rates boost your profits! If you're not using these cutting edge solutions in your business, you're letting LOADS of your customer repeat business walk-out your business door. Online Electronic Commodity for Your business Bill Payment Services Center System | Prepaid Phone Services Cellular Solutions Provider for Retailers. Business owners use our bill payment services - prepaid cellular phone providers strategies not to get more of the same, retail business owners use them to get more experienced solution service. Why not add another proven solution & store service-product to your business mix? Get more of the most desired, most profitable money solution store product from experienced provider. One-Stop-Shop-Money Solutions System, proven complete in store online bill payment system services | prepaid phone cellular services system for retail businesses walk-in customers. The wave of the future powerful solutions for today's retail merchants. Walk-in Online Electronic Online Bill Payment Services | Prepaid Phone Cellular Services. Truth of solutions generates consistently results repeat customers for your retail businesses. Walk-in electronic financial services are secure, reliable & nationwide. Discover perfect walk-in money solutions for your business & customers. Continental U. S. A. 50 States, Including Alaska, Hawaii, Puerto Rico, & U.S. Virgin Islands. To get more information about product, please email us at [email protected] and/or web site or contact us at 877-947-3577. Anyone who apply will be asked to provide a Tax Id Number, State/Local business license or resale certificate, and/or other form of proof they are a valid business to signup for payments solutions. Although we deal directly too retailers to provide the best possible customer service and proven great discounts to store owners, our goal is to sell through existing retail convenience stores of that maximize retail repeat walk-in foot traffic. Prepaid Cellular Point of Sale Cellular Phones Activation recharge payments System with Electronic Bill Payments Services Premium Money Merchant Retailers Payment System Solutions - No Inventory Expenses System in-store Bill Payments Services for Merchant Retail Dealers walk-in customers, designed to bring in proven amazing repeat foot traffic too retail merchants. The wave of the future powerful solutions for today's retail merchants. 'Walk-in Online Electronic Online Bill Payment Services | Prepaid Phone Cellular Services.' Truth of solutions generates consistently results repeat customers for your retail businesses. Walk-in electronic financial services are secure, reliable & nationwide. Discover perfect walk-in money solutions for your business & customers. 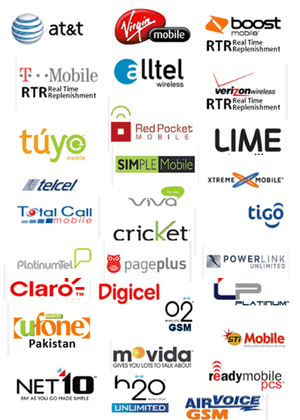 50+ Major Cellular Phone Service Providers and More!. Cellular Phone Wireless Services Solutions doesn't require any special hardware neither software to implement one-stop-stop bill payment services system or cellular service providers, new easily for retail clerks simplified technological techniques for your businesses. Services will operate on any retail merchant terminal or personal business computer. Equal-convenience for your customers. (The One-Stop-Shop) in-store electronic bill payment services | prepaid cellular solution for merchant retailers, leading trust-worthy bill payment services system for merchant retailers walk-in customers. If we can help you in any way, please do not hesitate to contact us!. Deal with expert staff. You will be extremely pleased with the outcome & great value, solutions bring to your business. Deal with business with experience. Delivering proven service-product experience to repeat walk-in customers. This is wholesale prepaid cellular services-bill payment service solutions site for merchant retail store owner product-service. Business owners only please. The Wave Of The Future!. SMART Retail Store Solutions. Offering online electronic bill payment services systems & prepaid cellular phone services providers solution to your customers, provides unique service that easily take the pressure off business owners, with less to deal with, along with owners having full inventorying control of the new easy electronically system, plus services help business owners build a thriving business without squeezing the capitalism out of your liquid and time. If you're a merchant retail business owner, and would like to receive the most knowledgeable beneficial benefits on how bill payment services & cellular phone services benefits your business.-distributorship, and customers. Electronic merchant service with multiple services. One Platform. Prepaid Cellular Solutions & Bill Payment Services with breakthrough high quality useful premium money solutions content...then this is a must read on. The convenient of electronic transactions is unparalleled. The prepaid cellular services offers pay-as-you-go option for your customers via a point-of-sale terminal or businesses counter top computer on your business counter. This service allow retailers to recharge or top a customers prepaid cellular phones on-line in matter of seconds, without the risks and issues associated with stocking scratch cards. This dynamic prepaid cellular phone services was created in response to the growing demand for prepaid cellular services distributor-distribution across the US. The prepaid cellular solutions is ideal for all types of convenience stores. Our convenience store terminal system is fast and reliable, 24 x 7. Never out of stock, and most importantly, we have what convenience store customers are demanding, prepaid cellular services from the carrier of their choice. The key word in maximizing the sale of wholesale prepaid cellular services products is convenience. This is how the prepaid cell phone user thinks, when he or she is about to run out of minutes, looks to the closest, most convenient location to refresh their account. They know there is no difference between $50 Boost Mobile Pin sold at one store versus another. Your customers need minutes, and they need it now!. You have the opportunity to sell products, without investing inventory, a control system that virtually eliminates shrinkage, theft, display space, and encourages repeat business into your establishment, along with your business having brand recognition in identifying your store with major prepaid cellular companies, of course, increased revenues. Prepaid telecom & money solutions is definitely a source of additional gross profits for your businesses. Any & All Billers For Your Walk-In Customers! Were you aware that there are literally millions of US households that do not have a checking account. Millions of these households need your businesses to use this highly needed conveniently way to pay their monthly cellular bills!. How many of these customers are yours? Now you can offer them an option...Bill Payments & Cellular Services. Start generating revenue by offering your customers a service that "closes the loop" on Electronic Bill Payment & Cellular Phone Service. Millions of Americans adults don't have a checking account, 25%-35% of all bills are paid by walk-in customers. You can make it easy for your customers to pay their bills, people who have limited transportation, prefer paying in cash, don't trust the mail or want a receipt by Bill Payment Service System. The Prepaid Cellular Phone Payment Service will provide a competitive advantage for all types of businesses. The Bill Payment Services will attract new customers, along with establishing repeat customers for your business, plus customers will purchase other goods and services while visiting your place to pay there Cellular Phone bill payments, we can't emphasize this enough, this bill payment service system will help your businesses in so many other great ways with goods and services you retail presently. This service is a great traffic builder, encouraging your customers to come back month after month. Getting customers into your stores to pay there bills is going to become more and more simple, once customers get used to, and know they can pay Cellular Phone billers their, It will become a habit!. Bill Payment Solutions that shares a common vision with you about how your business can win in your market. This will be exciting of your business becoming need-fillers for your customers, the new emerging innovating Bill Payment Service, Cellular Service Providers concept. Think about it. This is all about how to increase traffic by deploying innovative strategies to make retailers more competitive with greater option innovations in technology, that hold the promise of generating additional capital to allow retailers to compete more effectively and allow merchants to be more effective pursuing the detail of retail. The new technologies involves no monthly fees or inventory costs. It's not how SMART your business are, It's how your businesses are SMART!. It's not what you know or who you know - It's who knows how to help YOU! - It's not what you're doing or not doing, it's how you're thinking & being. Why not master solution how to deal with the mindsets that are holding you back for the wave of the future technology store product?. Most important, It's NOT what you say about your business that counts nearly as much as what others say about your business to others. Take advantage of services DIRECT today!. It pays to deal DIRECT, we know what SMART solution services can do for your BUSINESS, Different from other companies, we generously offer, Excellent Profit Margins, which no other company will top. Compare and see for yourself!. Our business is here to help your profitability, by offering the most easy to use for clerks retail bill payment licensing and prepaid cellular phone services system in the industry. Whether you are a small business retailer or a large retail chain store distribute distributor, Prepaid Wireless Direct has the SMART solutions for you and your customers. Distributorship licensing provider of walk-in electronic bill payment services for financial banking Bill Payment Institute & Cellular Phones Services Technologies Systems. Convenient and easy top-up of prepaid cellular service for consumers, plus no inventory cost for retailers capitalizing with walk-in bill payments & cellular phone service provider processors and more. The Wave Of The Future. This site tells you all about us and what we can do for you, as well as showing you a range of our services. Retailers here-bouts the need and your niche to come up with something new and exciting, to attract new business, new revenue stream with consistent repeat customers. The new emerging innovation concept for expanding merchant retail businesses. Don't miss out on the most profitable category in stores like yours. Get your prepaid services solutions from the largest provider of prepaid services in the world. Sell prepaid airtime from all the national and many of the regional wireless carriers. Prepaid Wireless Direct can help! NO RISK OF EXCESS INVENTORY, PAY AS YOU SELL. SELL PRE-PAID CELLULAR SERVICE PRODUCTS THROUGH YOUR VERIFONE TERMINALS. NO VERIFONE TERMINAL, NO PROBLEM, WE PROVIDE AN INDEPENDENT POINT OF SALE TERMINAL OR YOU MAY USE YOUR PERSONAL BUSINESS COMPUTER AS OPPOSED TO A TERMINAL TO OFFER YOUR CUSTOMERS OVER 40 MAJOR CELLULAR SERVICE PHONE PROVIDERS. THE NEW EMERGING INNOVATING WEB BASED SOLUTION CONCEPT FOR MERCHANT RETAILER SERVICES. ELECTRONIC WALK-IN BILL PAYMENT USE COMPUTER, PRINTER AND INTERNET SERVICES. Electronic Online Bill Payment Service & Cellular Phone Services Provider and More From A Single Company! We believe in your right to privacy. Please be assured that any information you give us will be Strictly Confidential, WE TAKE PRIVACY SERIOUSLY!. Enjoy your browse. Only Serious Business Authentication Minded Inquiries. (#1 Rated - Business Owners top recommended exceptional retail licensing implementation partner for Financial Banking Bill Payment Services Institute | Prepaid Cellular Phone Provider Services Technologies Systems. Provider For Master Agent Distributor Distribution | Merchant Retail Businesses. Every once in a while a product comes along and revolutionizes the way we do business. Electronic Online Bill Payment Service & Cellular Phone Services is One Such Product. The prepaid wireless service offers pay-as-you-go options via a point-of-sale terminal at the retailers counter. This service allows retailers to top-up all types of customers prepaid services and more!, in addition will recharge wireless phones on-line in a matter of seconds, without the risks and issues associated with stocking scratch cards. This dynamic service was created in response to the growing demand for prepaid services across the U.S.
Prepaid Wireless Direct service providers have the solutions to the problem of prepaid services. Historically, the delivery of prepaid cellular services has been achieve through physical cards (often called "vouchers"). Retailers of prepaid card services are with high cost inventory, because of multiple face values from multiple providers companies, theft risks, space requirements and inventory management, not any longer with Prepaid Wireless Direct POSA solutions that eliminate retailers risk and distribution cost, plus your location earn more per sale, this is our direct new business solutions to help the retailers of the future. The concept of contract wireless is foreign to no one. What consumers seem to have forgotten is that they are locked in to one and two year contracts giving them little choice after they accept the terms of such agreements, not such with prepaid cellular. The only difference between prepaid wireless and contract wireless is that your customers are in full control. It is time your customers discover what other subscribers around the world have known for a while: Prepaid Wireless is the best alternative, it is the future of wireless. With the number of payment station locations on the rise, it means you will offer a growing number of immediate biller connections to your customers, and the value of the service to everyone increases. Companies sell their prepaid services through manually loaded live PINs. This is both labor intensive and subject to human error and is gradually changing. Prepaid Wireless Direct POSA Systems is positioned to take advantage of each carrier's on line recharge capabilities as they become available. Another noteworthy item with the major carriers is the high price of handsets. This problem is being solved by some of the regional wireless carriers through the use of low cost refurbished handsets. Prepaid Wireless Direct POSA Systems has established relationships with several of these carriers and expects to have relationships with as many as 100 US wireless regional over the next two years. If you wish to join the thousands of merchant dealers offering bill payments & prepaid products and services to your customers, We will provide you the information you need to compare our company with our competitors and make a decision, if you decide to join us, we will quickly process your application WITHIN 24 HOURS. Doing business with Prepaid Wireless Direct is easy. Our customer agreement is one page. The commissions or discounts you will earn are the highest in the industry. There is no long-term commitment required and no equipment lease. Ours is not a very complicated business. We provide electronic payment & prepaid wireless service to your customers through a computer & point-of-sale terminal and, after they pay you, you pay us. We maximize sales and profitability by making sure we never run out out of product. It's that simple. We do everything we can to ensure that we focus on those important facts. If you are ready to work with most qualified team in the industry! We are ready for you!. Call us at 1-877-947-3577 to speak with a representative now.